Earth Fare, the authentic specialty organic and natural foods grocery store, has opened their newest location, located at 11700 San Jose Boulevard. This will be the 42nd Earth Fare location nationwide and the second in in the Jacksonville area. Earth Fare has committed to continued growth throughout Florida, and operates stores in Ocala, Gainesville, Tallahassee and Seminole. The first ever Florida Oktoberfest & Music Festival will hold some of the biggest stars in rock, alternative, and country music, is set for October 6,7, and 8, 2017. Jacksonville’s Metropolitan Park will play host to three jam-packed days and nights of music and Oktoberfest fun. The festival will feature activities for all ages including a 100 ft ferris wheel, games, and inflatables zone, and arts and crafts vendors. Children under the age of 12 are free to attend. Festival goers will be able to travel around Germany and purchase a wide variety of German and Oktoberfest style ales. Additionally, 15 of North Florida’s most popular food trucks will create a German inspired dish as well as their most popular menu items. The Jacksonville Jaguars Starting Quarterback This Season Will Be Blake Bortles. Just one week after head coach Doug Marrone suggested that the job was up for grabs, the Jaguars starting quarterback competition has reportedly been settled. The man to lead the offense for your 2017-2018 Jacksonville Jaguars will be Blake Bortles. Coach Doug Marrone has picked fourth-year player Blake Bortles over Chad Henne to be the team's starter for the Sept. 10 season opener at Houston, a surprising turnaround for a player whose career with the team seemed to be in jeopardy a week ago. Coach Marrone gave Chad Henne the start in Jacksonville’s third preseason game, but was apparently unimpressed by Henne’s 8-of-14, 73-yard performance. Bortles was better, connecting on 12 of 16 throws for 125 yards and a touchdown. Bortles has started the last 45 regular season games for the Jaguars, but a dreadful start to the 2017 preseason following his downturn in 2016 led Doug Marrone to bench him in favor of Chad Henne for the third preseason contest. Henne went 8 of 14 for 73 yards while getting sacked three times with the first-team offense, while Bortles completed 12 of 16 passes for 125 yards, a touchdown and a pick with the subs. The Ponte Vedra Concert Hall presents rousing, down-home feel-good blues musician Elvin Bishop and his Big Fun Trio live at the Ponte Vedra Concert Hall on Sunday, November 19, 2017. Tickets for Elvin Bishop’s Big Fun Trio go on sale this Friday, August 25 at 10 a.m.
A lot has happened since guitar legend Elvin Bishop released his last album, 2014’s Grammy-nominated Can’t Even Do Wrong Right. He was inducted into the Rock And Roll Hall Of Fame, and soon after into the Blues Hall Of Fame. He won the Living Blues Award for Best Blues Album Of 2014 and three 2014 Blues Music Awards: Album of the Year, Song of the Year (for the title track) and The Elvin Bishop Band took the award for Band of the Year. A new community in Northern St. Johns County called Beachwalk will have residents living there before the year ends. Beachwalk is planned to be an upscale neighborhood anchored by what is essentially a 14-acre swimming pool. Plenty of work has already been done, and developer John Kinsey and others associated with the development were in town Thursday for the official groundbreaking ceremony. The enormous Crystal Lagoon has been dug out and is taking shape. Water should fill the Lagoon as soon as July of this year with residents living around it by fall. The project being done by Art Falcone’s Encore Capital Management and Kinsey’s Twin Creeks Development, brings a man made lagoon into the project and makes it part of the unique character of the community. The architecture, landscaping and amenities will be different from any other community in the area. It will offer a beach vibe with palm trees rather than live oaks and sandy beaches around the lagoon. Jacksonville Fl - This year, the Greater Jacksonville Agricultural Fair's entertainment lineup promises something for everyone. A broad range of top performers will take the stage during the 12-day event, treating audiences to everything from classic rock, country and blues to golden oldies. All entertainment will be on the outdoor stage and will be free with admission to the Fair. Thursday, Oct. 31 7 - 11 p.m. Metropolitan Park Halloween night, Metropolitan Park on the river will be transformed into Haunted Harbor – the ghost pirate island. On the stroll through Haunted Harbor, guests can grab sweet treats, hear tales from beyond, and have fortunes told before reveling in the ultimate outdoor costume party at the park. This first Halloween Haunted Harbor party is sure to be a memorable event. Click here for more information. Friday, Nov. 1 at 11:30 a.m. West Club at EverBank Field University of Florida Inductees: Jevon Kearse & Lindy Infante University of Georgia Inductees: Peter Anderson & Matt Stinchcomb Reserved seats are $60; Corporate tables (10 seats) $600 Call (904) 630-3600 for more information and reservations. 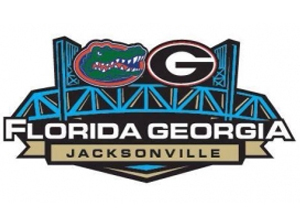 JACKSONVILLE, Fl – The Jacksonville Landing welcomes The University of Florida and The University of Georgia fans for a weekend celebration surrounding one of the most infamous rivalry football games. The Landing has scheduled a variety of entertainment to appeal to fans of all ages throughout the property. 1) North Florida’s Biggest Halloween Party 7 p.m. – Midnight Kick off FL/GA weekend on the river featuring live music on the Riverfront Courtyard Stage by Radio 80, giveaways, drink specials and a costume contest with a $1,000 cash prize. 2) DJ Marco at Fionn MacCool’s 9 p.m.
3) Thomas Rhett live in concert at Mavericks. Doors open at 6 p.m.
1) DJ Capone and Company with host Chris Cantillo in the Courtyard 7 p.m. – 1:30 a.m. 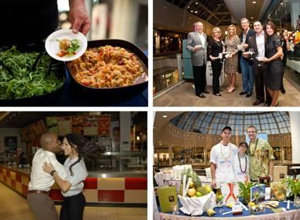 There are lots of events happening around Jacksonville this weekend. Heres our top picks. Jacksonville FL - This Saturday, October 26th @ The Town Center will be a huge bar crawl. 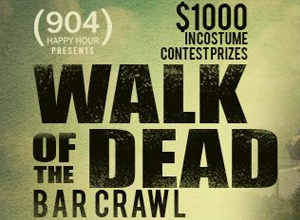 The Bar Crawl, presented by 904 Happy Hour will jump between Blackfinn, Whisky River @ Suite. There will be a $1,000 costume contest and much more. Tickets online cost $10 and $15 the day of. Tickets include: 3 free shots, free cover, discounted drink specials and much more.